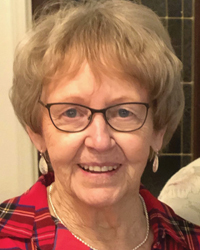 At the age of 80, following a lengthy struggle with her health, Audrey Edith Merlo passed away peacefully, on Tuesday, March 19, 2019 with her immediate family at her side. Her final days and moments will be forever cherished by family and friends, as her sense of love and humor shone through, leaving precious memories. Audrey was born in Medicine Hat, AB on August 6, 1938 where she grew up with her 8 brothers and sisters. Audrey met and married Lee prior to moving to Grande Prairie in 1961. Audrey was blessed with a large loving family, and countless great friends. Through her kind and caring nature, Audrey always put others first. She had the gift of making close friends out of complete strangers, be it at the bowling alley, curling rink, or golf course. This continued throughout her life and into her final years, including close relationships garnered with her many precious caregivers. Audrey is survived by Lee, her loving husband of 63 years; children: LeeAnn (Francis) Kinderwarter, Pete (Lori) Merlo, Laura (Rob) MacLean, and Lena (Gord) Buechner; 14 grandchildren and 23 great-grandchildren. She was predeceased by her parents Lois and Fred Rance. A Funeral Service will be held on Saturday, March 23, 2019, at 11:00am, at St. Joseph Catholic Church (10404-102 St., Grande Prairie, AB). A luncheon will follow at 12:30pm at the Grande Prairie Golf and Country Club (711040, Resources Road). In lieu of flowers, Audrey and her family have asked that memorial donations be made to the Salvation Army (9615-102 St., Grande Prairie, AB). I am so saddened to hear of the passing of Audrey. She was a wonderful lady, where ‘family’ really mattered. She always made a point of keeping in touch, always caring and concerned for Mom, Joyce, Grandma Hanson, really everyone. My sincere condolences to Lee, and the entire family. All your lives are forever enriched by the love and care she so willing gave to all of you. Please cherish the memories- there will be so many! My love and hugs to all.